For next Summer, Miuccia Prada has imagined a real/ wearable fashion putting forward the normcore trend as a reaction to these difficult times when you have to play low profile with simple clothes already existing. Austere clothes for a period of austerity. "Boring" clothes with classic cuts. Have we reached a time when we will have to follow this mood of austerity? Are the fun days over? Are we reaching a dead end? 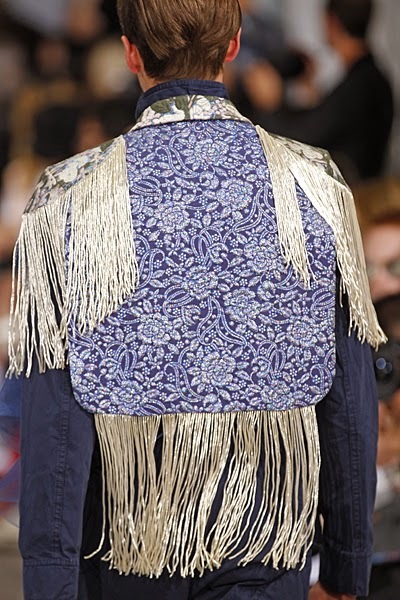 Does avant-garde mean now wearing comfortable and real clothes without any originality? After her ugly chic collections, it seems that Miuccia Prada is now turning herself toward a less complicated fashion more anchored in today's life. Is Boring the New Cool? 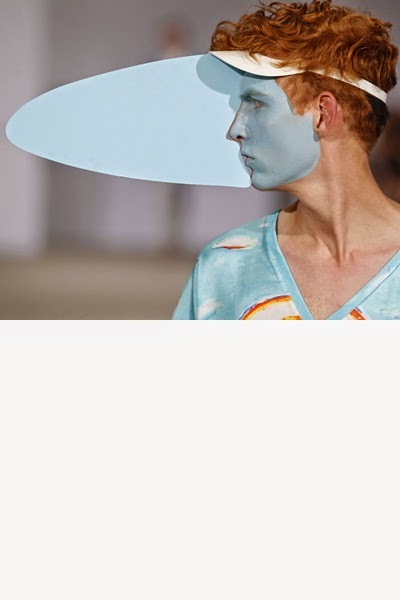 We don't really believe in this idea like Walter Van Beirendonck because no matter when you live, it's the duty of Fashion to spread an inventive and somehow provocative message that makes us travel, dream and reflect. 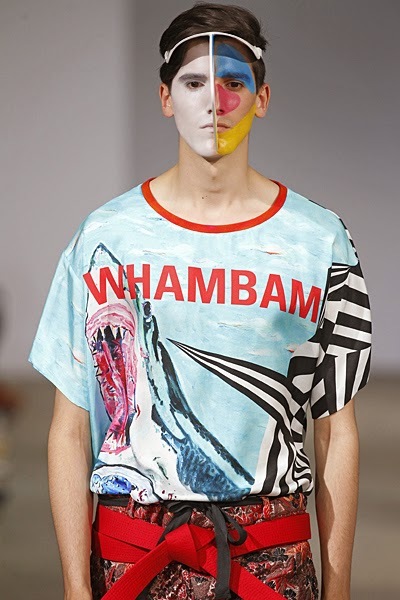 His SS15 collection called Whambam is the perfect illustration of Ms Prada calls eccentricity, a surrealist travel, an acid trip mixing different archetypes of masculine beauty such as the surfer, the dandy, the samouraï and the tribal warrior. All the details of each silhouette were exaggerated. The archetypes were represented in the extreme. 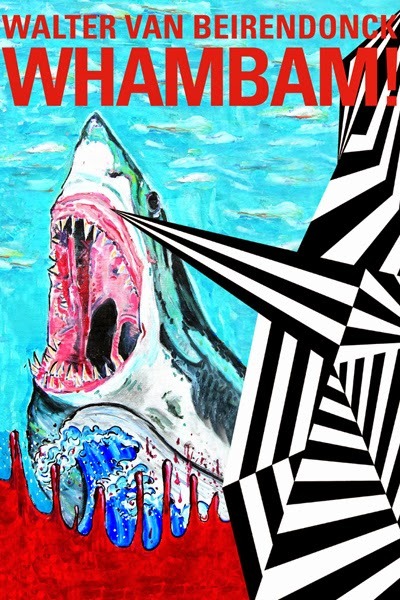 The surfer-like combi had gone through a surrealistic journey and the crazy make up with this idea of double strengthened the idea of "tribality". These silhouettes were anti-conformist, anti-normcore mixing at the same time femininity & masculinity, fragility & strength. The soundtrack of The Acid also helped to carry away the audience for the designer's trip from the simple idea of Japan to that of tribal surfers. 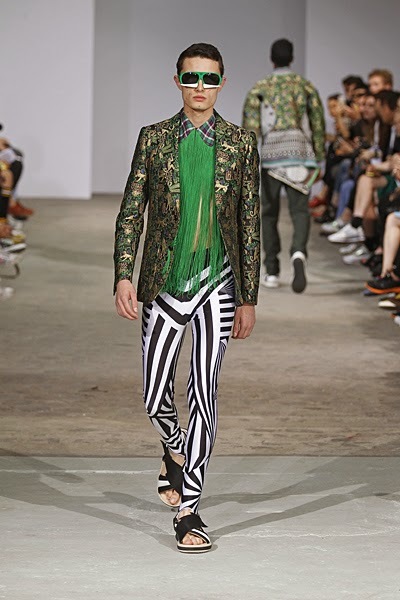 Walter Van Beirendonck started with the deconstruction of the Edwardian suit made of several different printed jacquards all assembled like a patchwork and paired loose judo pants. 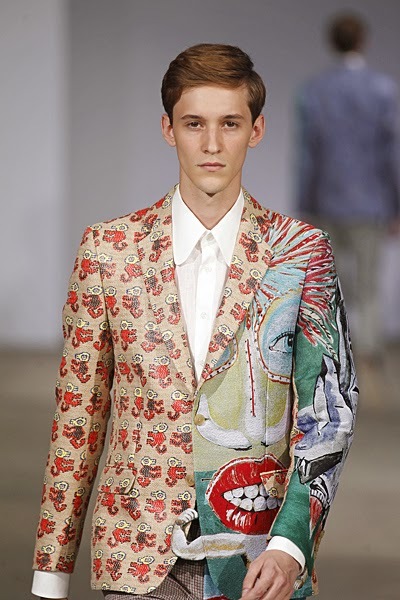 There was also a high level of sophistication as some silhouettes combined classic jacquard fabrics in vibrant colours with surrealistic horror illustrations (ugly parts of a face) and tribal printed motifs. 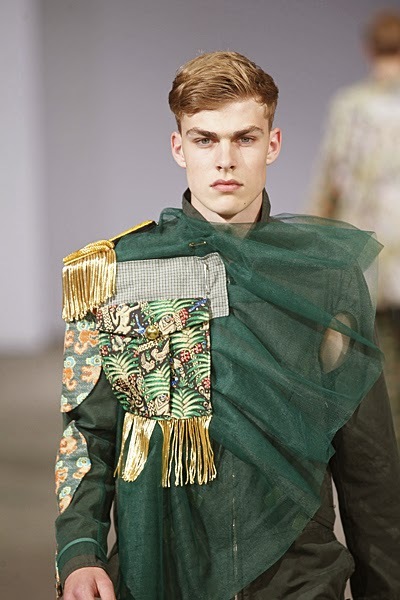 In this trip, there was also a new interpretation of the Sergent Pepper figure in a military style jacket embellished with a tulle drapery. 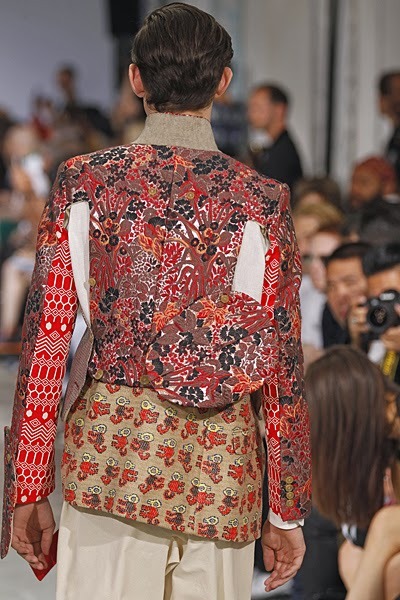 In this endless exercise of interpretation, the Belgian designer reworked the figure of the samouraï in the shape of oversized printed kimono jackets combined with loose printed harem pants. 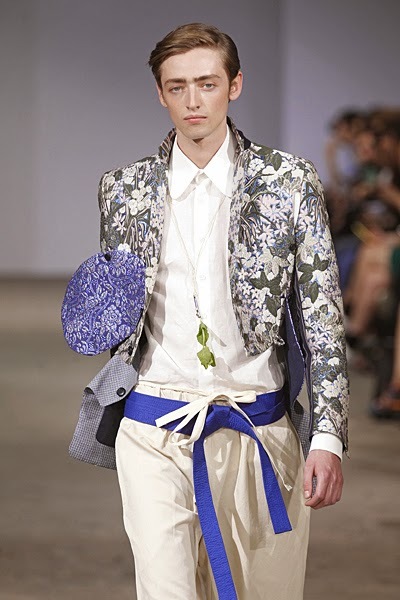 For him, the suit is a combination of heavily printed leggings, a fringe shirt and a printed jacket paired with large sunnies. 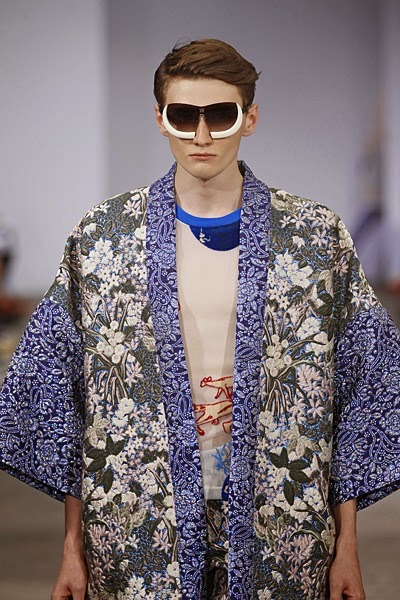 In this regard, the accessories also underwent a dramatic change to give even more power to the silhouettes: the successful collaboration with Linda Farrow gave birth this time to sunglasses looking like tribal masks with an impression of bones going out of your nose. 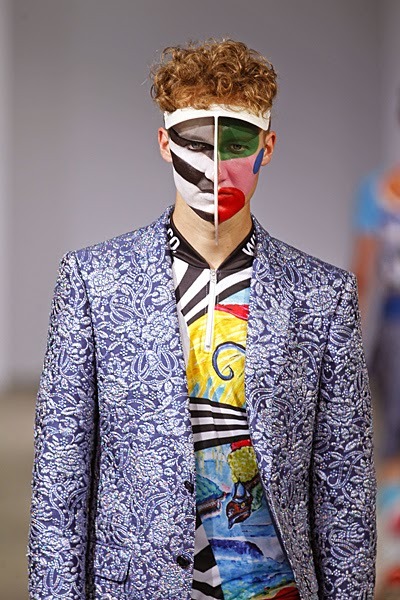 The viral moment of this collection was the arrival of the models wearing über exaggerated caps (separating the models' faces into 2 very different parts) and psychedelic neoprene combi for an idea of double personality: Femi-masculinity. 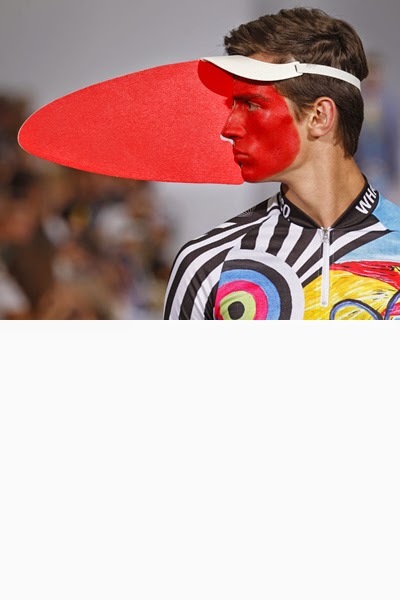 Van Beirendonck's surfers have never been seen before. Are they the result of an acid trip or a fantasy? Perhaps both? The radical beauty of this collection is undoubtedly a reaction to this idea of social normality, to the look you must have to be part of society. 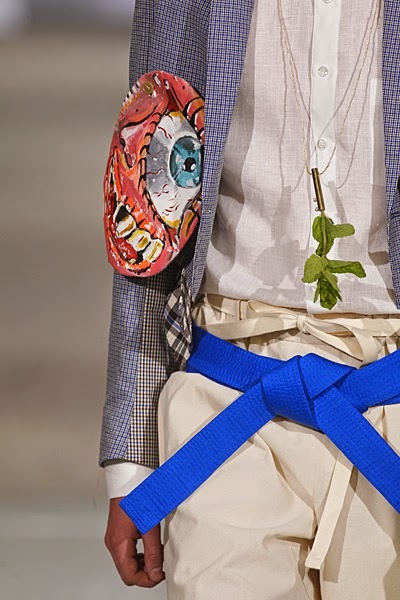 Since the beginning, Walter Van Beirendonck has designed collections for his customers to be unique and to stand out and not unique in a certain normality. We love and respect the fact that he never plays safe contrary to others... As gay guys, we are not accepted so why playing this game of normality and taking part in this mascarade? Diversity is the key, the answer to this normcore trend and in this troubled time, we should never get tired of looking for something new, something special, something beyond. 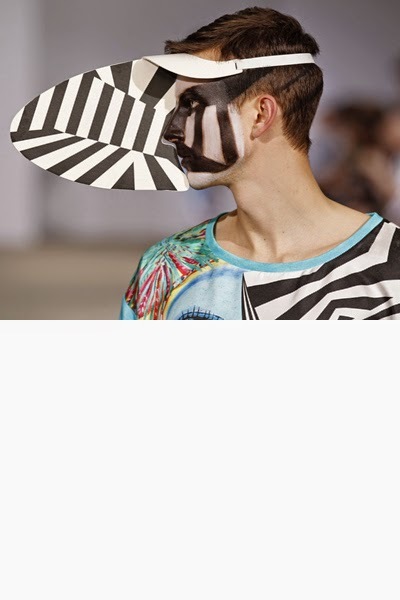 All these pictures come from Walter Van Beirendonck's website.